Horror is evolving as a genre. Although your local multiplex is still peppered with the usual contenders, look a bit closer and you’ll find the latest drama, thriller, or crime offering is closer to horror than you might expect. In this bi-weekly series, Joey Keogh presents a film not generally classified as horror and argues why it exhibits the qualities of a great flight flick, and therefore deserves the attention of fans as an example of Not Quite Horror. This week, it’s Justin Kurzel’s gothic, bloody re-imagining of the Shakespearean classic Macbeth. Considering Roman Polanski and Orson Welles have already had their shot at it, one could be forgiven for thinking we’ve already seen all the ways Macbeth could be adapted for the screen. After all, if these auteurs haven’t said all that needs to be said about Shakespeare’s shortest tragedy, there probably isn’t a hell of a lot else lurking beneath the surface. Step forward Australian director Justin Kurzel, most likely to be known to genre fans for Snowtown, his grueling take on the infamous Snowtown murders. How a man can go from an insular, grimy, kitchen sink thriller set in his native land to a massive, sprawling Shakespearean tragedy filmed entirely on location in the wilds of Scotland (during a bitter winter, no less) is anybody’s guess, but it works. 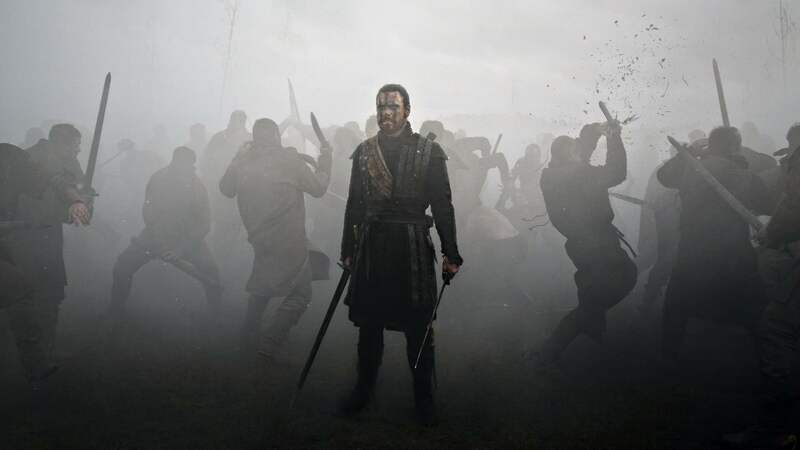 Kurzel’s Macbeth, as several critics have noted, re-envisions the story as a horror movie. Dousing everything in a Gothic wash of muddy greens, blues, browns and greys, the land stalked by the titular character and his scheming wife is unflinchingly bleak. Unfair comparisons to the landscape of an epic Guinness commercial notwithstanding, Kurzel has painted a queasily realistic setting in which his characters can run amok. The performances are incredibly committed across the board, verse rattled off as though the actors have been speaking it their whole lives. 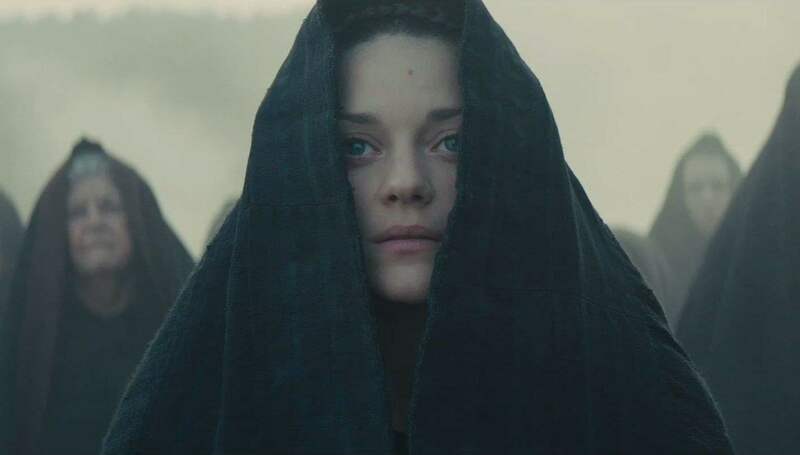 Esteemed character actors Paddy Considine, David Thewlis and Sean Harris all do an incredible job but it is the incomparable Michael Fassbender and Marion Cotillard who elevate Macbeth from pessimistic tragedy to full-fleged Not Quite Horror. A war-scarred victim of PTSD, who is also dealing with the death of his child, Fassbender’s Macbeth is a tortured individual who slays with ease on the battlefield but finds himself torn when faced with the irreversible act that will grant him the kingship. As his meddling wife, Marion Cotillard is Morticia Addams-pale, draped in cloaks of deepest black, her eyes wide and calculating. Alone, he or she would be noteworthy but together they are awe-inspiring. Theirs is a symbiotic relationship played out in pared back, shared scenes–the most powerful of which sees their murder plot used as an aphrodisiac–where hushed words and shared glances communicate a lifetime spent fighting to survive everything, including each other. Even when they’re surrounded by other people, it’s as though they are alone, particularly when the Lady refers to the King’s past issues. Macbeth begins and ends with a vicious battle, showcasing the kind of bloody violence horror fans will find tame but that will have mainstream audiences diving for cover. Swords are plunged into flesh in slow-motion, challenging us to look away. This is a world in which a coven of witches haunt the sidelines and it seems totally natural, thanks to the eerie glow of the gathering fog. This Macbeth is smothered in darkness. Even in its more celebratory moments, the refrain “Hail Macbeth” becomes crawlingly creepy alongside Fassbender’s hollowed-out stare. This is a brooding, cruel, bloody take on a story we think we know that is gripping right up until its final moments. This Macbeth is the horror we perhaps always knew it was, stripped back to reveal its darkest intentions and all the stronger for it. Five Reasons Why “Teen Wolf” (1985) is Totally Tubular! Behold! The Alien Covenant Trailer Is Here!